2017 Camp Fairhaven dates — June 12 through August 4. During the summer we offer a day camp in which hundreds of children come together for a great time! The campers enjoy swimming in the indoor lap pool, riding horses, and participating in field trips every week. Though there are many fun activities, we also take time to teach each child crafts as well as recreational and team sports. Along with these great activities, each day includes Bible preaching and teaching. Camp Fairhaven has been one of the largest and most successful Christian day camps in the country, and we are continuing that tradition with special weeks of excitement and fun for our campers this year. We are dedicated to helping meet youngsters’ needs as they grow up. Campers will have a summer they will not forget. We are looking forward to an event-filled summer. Adventures will include an amusement park, a minor league baseball game, and an overnight. Your child will not want to miss the activities this summer, so make sure you register for individual weeks desired. Camp will start in early June for ages 5 through 12 years old. Our daily program starts at 9:30 a.m. and ends at 3:30 p.m.
Camp Fairhaven has sports, crafts, and fun; but campers also have the opportunity to hear the Gospel of Jesus Christ and to play in a Christian environment. Here campers learn true patriotism and appreciation of our American heritage, enhance and expand their knowledge of the Bible, and replenish and increase their spiritual resources so necessary for growing up in today’s world. Camp Fairhaven is located in Chesterton, Indiana, on 65 beautiful acres of land. The camp facilities include a 20-acre lake, a large gymnasium, indoor swimming pool, and plenty of ball fields. The buses of Fairhaven Baptist Church are used to transport the children on their exciting and educational field trips. The school’s air-conditioned building is used for films, crafts, and many other indoor activities. Transportation is provided for campers from local areas for a fee of $10 per week. A $20 per week fee will be charged for those coming from outer areas. Pick-ups are not guaranteed to be at your door; they may be at central locations. Please call the camp office for more information regarding these stops. We have a hot lunch program four days a week for a fee of $2 per day. Children may bring sack lunches also. Pop and candy are sold at reasonable prices. Camp Fairhaven is a non-profit organization. Campers’ fees only cover operating costs. All construction is financed by personal gifts. Costs are kept to a minimum to allow all the children of this area the opportunity to attend camp. All the staff and counselors of Camp Fairhaven are trained in working with children. Head counselors have college degrees and many years of experience providing an atmosphere of wholesome fun in an orderly environment. Campers are not merely “let out to play.” They are taught the skills of the sports they participate in. 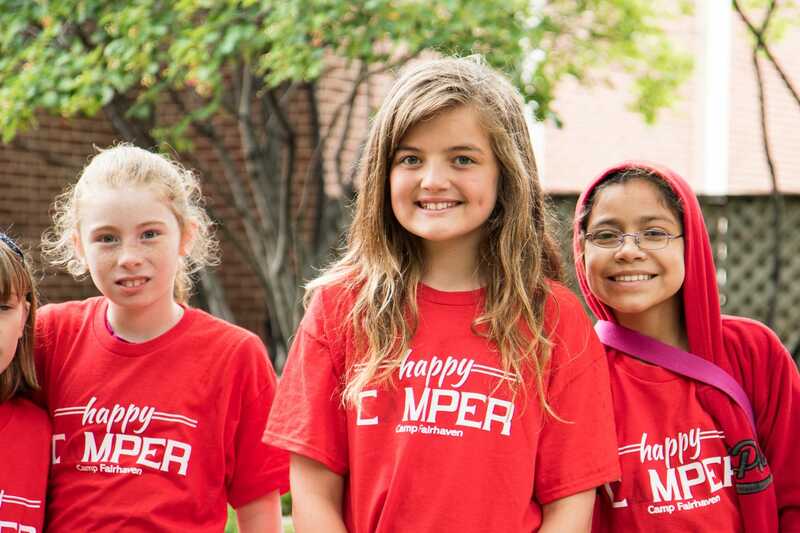 The campers are grouped by their ages; and while some are active in team games, others are receiving special guidance in crafts, boating, swimming, etc. There is a good ratio between our trained counselors and the campers. Comfortable, modest clothes should be worn. Be sure your child has well-fitting sneakers or gym shoes. Campers will also need swimsuits (one piece for girls), towels, and jackets on particular days. No shorts or halter outfits are permitted. Culottes may be purchased through our bookstore or ordered in advance. Make sure your child’s name is on all clothing. For those desiring extra help in these subjects, the faculty of Fairhaven Baptist Academy provide tutorial classes. Phonics is used in reading. These special classes are invaluable to any student but especially to those having trouble. The classes will be taught for eight weeks starting in early June. The cost is $200 per course for the first child in each family, $150 for the second child, and $100 per course for any other children in the same family. If you would like more information regarding the summer clinic, please contact the academy secretary during at 219-926-6636.